Fennel contains volatile oils, flavonoids including rutin and quercetin, as well as coumarins, phytosterols, fixed oils and sugars. 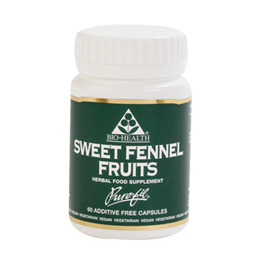 Sweet fennel is calming and supportive at times of hormonal change. Fennel is an aniseed-flavoured perennial herb indigenous to Europe and cultivated in India, China and Egypt. Both fennel seeds and bulbs are commonly used in cooking in the Mediterranean, Middle East and Asia. Sweet Fennel Fruits. Capsule shell: Hypromellose. 1-2 capsule swallowed with water twice daily. Below are reviews of Sweet Fennel Fruits - 60 Capsules by bodykind customers. If you have tried this product we'd love to hear what you think so please leave a review.